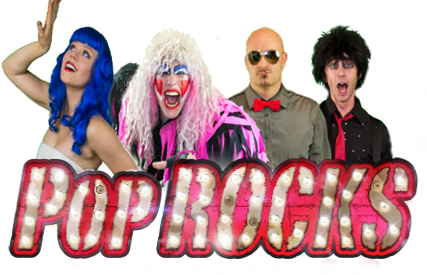 PopROCKS is not just a band; it’s a HIGH ENERGY LIVE MUSIC SHOW expertly designed to keep you dancing and laughing to the BIGGEST DANCE PARTY HITS all night long. PopROCKS brings you the best of today’s hottest hits, 80s rock, throwback hip-hop, disco, and timeless party classics all mashed up and delivered in a PARTY ZONE format with a Broadway twist. PopROCKS is what you get when you combine the club music of a DJ, the live energy of an Arena Rock extravaganza, and the theatrics of a Broadway musical! With four dynamic lead vocalists, PopROCKS delivers a unique variety that is unbeatable! As a group, PopROCKS members enjoy a dynamic, high-powered chemistry that is as infectious to the crowds as their playlist of HIT DANCE PARTY TUNES! PopROCKS is a night of entertainment you will not forget! !